What Happens if German Orthodoxy Disappears? So if you've seen my posts about KAJ NY and Monsey, you heard the happy tale of my discovering German Orthodoxy still living and breathing in our times. But as a German Jewish type, I'm not going to allow myself to exaggerate and wax romantic. I did indeed find elements of German Orthodoxy in the KAJs, but there's no denying that this is neither Frankfurt circa 1870 nor Washington Heights circa 1950 or even 1980. So while you'll see at KAJ remnants of the old German Jewish decorum and Hirschian approach, you'll also see lots of Eastern Europeanism in there. You see one Hirsch chumash on the shelf and 50 Artscrolls. Same with the siddurim. However, you won't necessarily see even that in a Litvish shul. I don't mean this as a criticism of the Eastern European approach but rather a lament for the waning of pure TIDE alternative. Certainly, you see TIDE elements in the American yeshivish world where general studies are part of the educational curriculum if only due to government rules and most people get jobs eventually if only due to the high expenses here. You see elements in the MO world where the idea of compassion for the gentiles and contributing to the society are tangible. However, you don't see much of pure TIDE with Torah being central at the same time that positive general studies are embraced, where one has compassion for the world but practices Austritt. German Orthodox in its pure form is leaving us rapidly I remember 25 years ago living in Monsey and hearing the term Breuers fairly often. I remember being captivated by the word. Today, you really don't hear it much. So what happens to Hirschian concepts like tikun olam, contributing to one's society, caring about humanity, reasons for mitzvos, learning a trade? Have no fear. The rock solid reputation of R' Hirsch is enough to keep them around. Of course, it's hard to be in a world that does one thing while you do your own with only books to back you up. That's one of the reasons I visit KAJ when I can, to feel that I"m not in this alone - Modern Orthodoxy not providing the support I need because of all the problematic pieces to it. But you don't need just Hirsch for these concepts. The Netziv talks all about light unto the nations. See my prior post about that. The Duties of the Heart talks about actually following the nations in the areas where they act properly (Introduction to Duties of the Heart, near the end). He gets it from the Gemara. The Shulchan Aruch, according to R' Breuer, talks about dignity and order in the synagogue. The Rambam talks about getting faith from studying nature. The Sefer HaChinuch gives reasons for the mitzvos. The Kuzari talks about faith coming from history. Many talk about the point of Torah study being for keeping mitzvos (Ramban - letter to his son, R' Soloveitchik in the Rav Thinking Outloud). R' Hirsch was remarkable in how he packaged all this up and again you still have Hirsch and to see his approach demonstrated through people like R' Breuer and others in the old kehilla, certainly that makes life much easier. But these concepts are all just Torah concepts. They'll live on. Be strong. Eastern Europeanism has transformed too. The old Litvaks are also gone. What we have today Haredism and Modern Orthodoxy. They offshoots of old Europe but not old Europe itself. And these will transform too. Life is ever changing. Torah is eternal. R' Hirsch packaged up Torah concepts and his package will last as long as it will last. Then it will go into the body of eternal Torah teachings by our great scholars. Spanish Jewry as practiced in Spain faded too and then the teachings of those greats went into the great body of work from which future generations drew. No movement is immune from this. You just do the best you can and God will take care of the rest. "The Migration of Torah Tradition from the Land of Israel to Ashkenazic Lands I hold of our tradition and that of our ancestors, the sages of Ashkenaz, whose Torah teachings were passed down to them from their ancestors since the time of the Churban (destruction of the Holy Temple). — The Rosh, R’ Asher b. Yechiel. Ashkenazic Jewry had yeshivos continuously, generation after generation, since the time of the Churban. They put their souls into the knowledge of the Torah and its observance, following its laws of justice and other halachos. Therefore, it is certain that their correct knowledge of its details goes back farther [than other traditions]. — R’ Yakov Emden. During the Second Temple Period, Jerusalem was the center of Jewish life. The kernel of Torah tradition was ensconced in the Lishkas Hagazis (Chamber of Cut Stone), the basilica set into the north wall of the Holy Temple. The Sanhedrin was situated there.1 The Sanhedrin was the superior court and the final word in all matters of Torah law. All eyes turned to the sages of the Sanhedrin for guidance in every area of Jewish life. From there Torah went forth to world Jewry. As such, it was the place to which the oral tradition of the Torah legacy was entrusted. After the destruction of the Second Temple, about ninety thousand Jews were exiled from the Land of Israel by the evil emperor Titus (39-81 CE).2 The Torah sages continued to safeguard the oral tradition passed down to them from earlier sages.3 This legacy was kept in its entirety by core yeshivos and by rabbinic supervision over its precise practice in the community." I have even taken abuse while at the amud! A number of years back, when we were just getting our Friday night minyan started, we tried to join with another (non-Yekkish) group who needed some support. They were supposed to inform their regulars that we were going to do the davening our way as an experiment, but I guess they didn’t get the word out. Halfway into Kabbolas Shabbos, one man screamed out, “This isn’t a Yekkishe shul!” and stormed out of the room. I just kept davening, shaken but not stirred. "Perhaps the day will come when all the things bestowed upon mankind for its benefit and liberation will become corrupted into their very antithesis. Mankind, instead of assuring its members their legitimate rights of development ... will serve them the tear-drenched bread of slaves and the worm-wood of bitterness.... At such time, science, too, will become solely destructive ... will frantically blind itself with its own brightness .... Mankind will vainly exhaust its strength in a blind upsurge of uncurbed desires ...."
Collected Writings, vol. 1, p. 80, [Ges. Pretty incredible that a person in the 19th century could foresee exactly what has happened to us. The Beit Midrash or the Shul Which is Holier And Why? Says Rav Hirsch: "Now, it is just because our Houses of G-d and the Divine services within them are not the essence of our worship of G-d, but are rather places and occasions for preparing ourselves for the worship of G-d in practical life. They take but second place in holiness compared to the Batei Midrash, houses of learning, which are devoted to the studying and teaching of the Torah. i.e., the inquiries into the prescriptions of the Divine Will as to how a G-dly life should be led by man." So you'll hear people spin this around and make the cultic seem like the ideal, that Torah study is just for study sake and that's why the BM is better. This is the opposite of how R' Hirsch approaches it. The very reason the BM is holier is because it applies to life. "Shadal series #2 - On Hirsch's 19 Letters and a controversy about the meaning of it's Hebrew title. 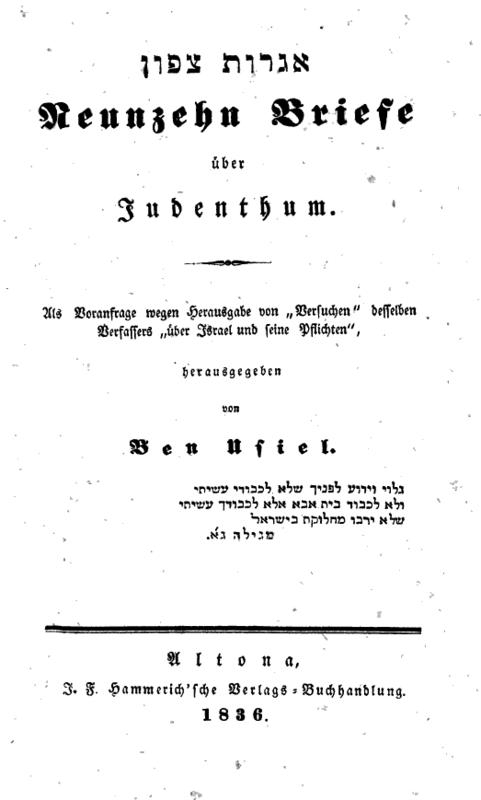 "The reason why I point this out is because in two prominent places scholars who knew a great deal about Hirsch severely criticized a third author, who wrote a book about Hirsch, for not only thinking it meant "Letters from the North," but even claimed that Hirsch consciously meant to parallel the Rambam's Iggeret Teiman, or "Letter to Yemen," since תימן, teiman also means "South" in Hebrew."